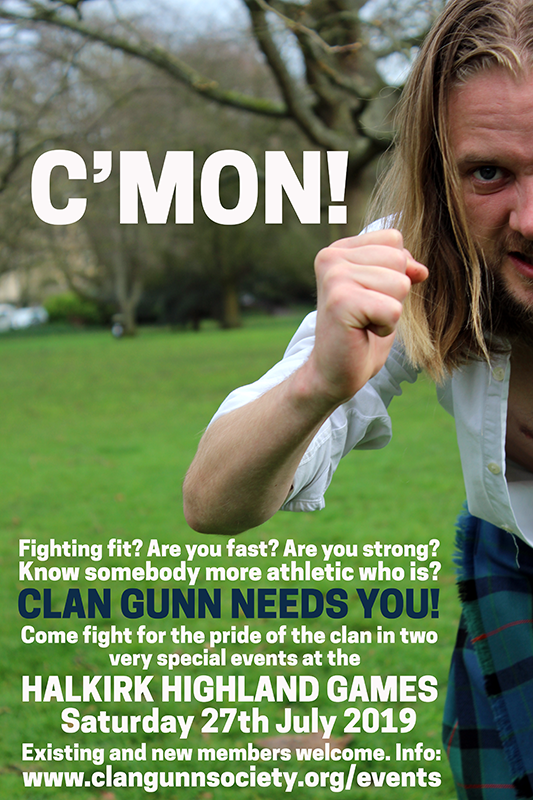 Welcome to the Clan Gunn and the Clan Gunn Society website. Check out our feature on BBC Alba at Kildonan Church during the 2018 Gathering. The caption translates “A special service has been held today in memory of the clearances. Gunn members also attended the service at Kildonan church and their international gatherings in the area. Doneil MacLeod has more.” A special thank you to BBC Alba for an excellent piece. 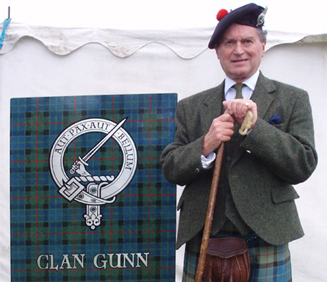 The Clan Gunn is one of the oldest Scottish Clans descended from the Norse Jarls of Orkney and the Pictish Mormaers of Caithness. Today there are members of the Clan in the UK, France, the Netherlands, South Africa, USA, Canada, New Zealand and Australia. The Clan was originally based on the east coast of Caithness, but from the fifteenth century the senior line settled in the Strath of Kildonan in north east Sutherland; the Robson Gunns had their seat in Braemore in south east Caithness and the third main family established themselves in Cattaig and Dalemore on the upper reaches of the River Thurso. I am most grateful for the congratulations and messages of support from members of the Clan worldwide on my recognition by the Lord Lyon King of Arms as Chief of Clan Gunn. There had to be some discussion on what the undifferanced arms of the Chief should be as there is no record anywhere of the arms. It has been agreed that they should be a red three masted galley with flags furled on a white background and that the supporters should be a Norse warrier and a Pictish woman bearing a sprig of juniper, the plant badge of the Clan, representing our descent from Sweyne Asliefsson and the Pictish Mormaers of Caithness. I was particularly glad that Colonel James Gunn and Rob Kamp Gunn who were responsible for organising the petition to the Lord Lyon were able to attend, and that Rich, the President of the Clan Gunn Society of North America, and Linda Gunn and Todd Wall, the past President of the Clan Gunn Society of New Zealand and his wife Sheila were also present to represent their societies along with members of the Clan from France and Nova Scotia. I look forward to Dave Ziemer’s term of office as President of the North American society and wish him and his Committee all success. As a result of my becoming Chief of the Clan my designation changes from Iain Gunn Banniskirk to Iain Gunn of Gunn. I hope that this is not too confusing. I look forward to seeing old friends and meeting new members of the Clan during the course of the year.